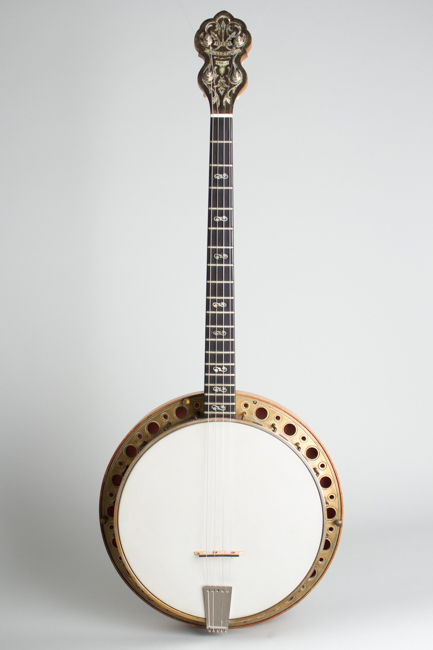 Iucci Mellotone Grand Model Tenor Banjo, c. 1925, made in New York City, serial # 152, natural finish, cast brass rim, laminated maple neck and resonator, hard shell case. 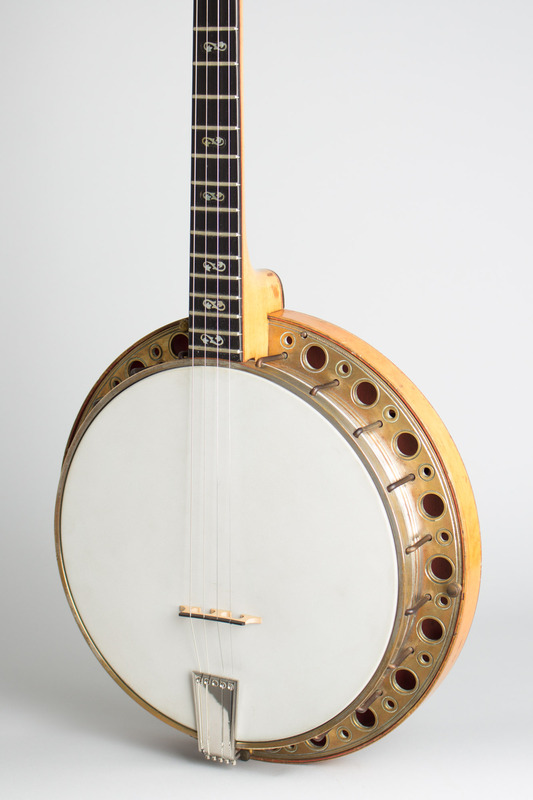 This Tenor banjo was made by Michael Iucci of 377 Broome Street, New York most likely in the mid/late 1920's. It is a high quality professional grade instrument equal to many of the best of the day. 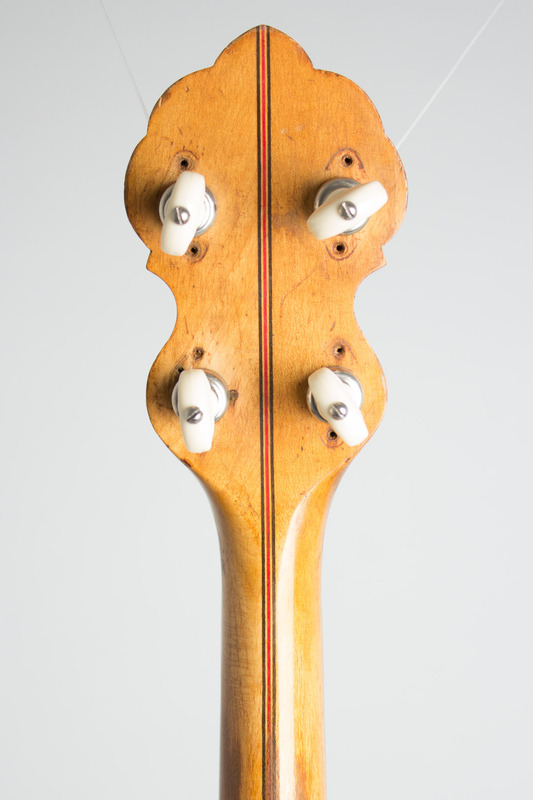 Iucci built all types of string instruments, first in NYC and later in New Jersey, but is best remembered for these quite high quality 1920's tenor banjos. 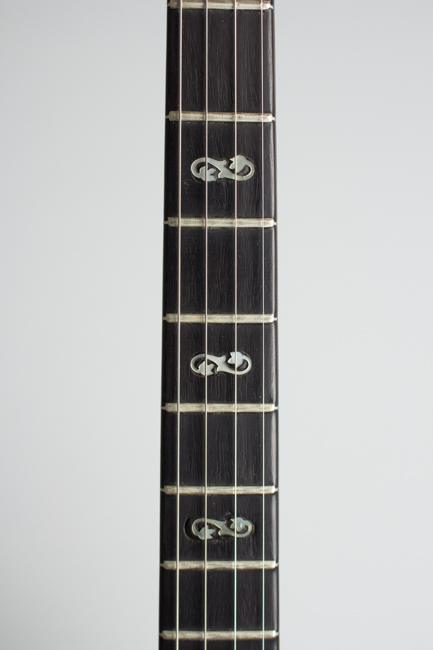 The construction is quite unusual, with a standard style laminated maple neck screwed directly to a turned brass integral rim-and-flange unit, which is mounted in a laminated maple resonator. 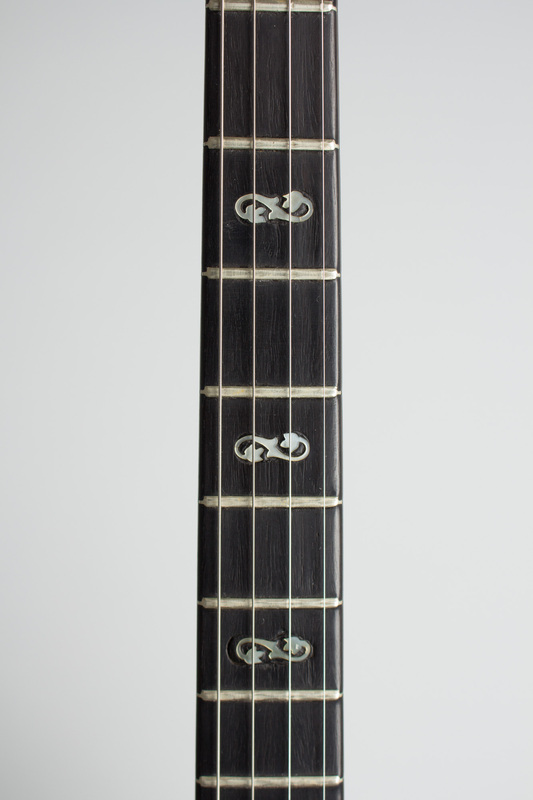 The ornamentation is at a medium level for the period, with an unbound ebony fingerboard ornamented with shaped pearl inlay, and colored wood inlay in both neck and resonator. The headstock is ornamented with highly engraved pearl with the legend "Iucci Mellotone Grand". 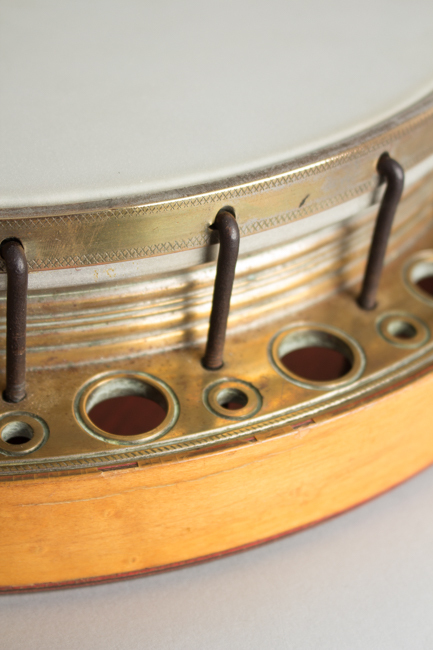 The metal flange has decorative engraving around the rim. 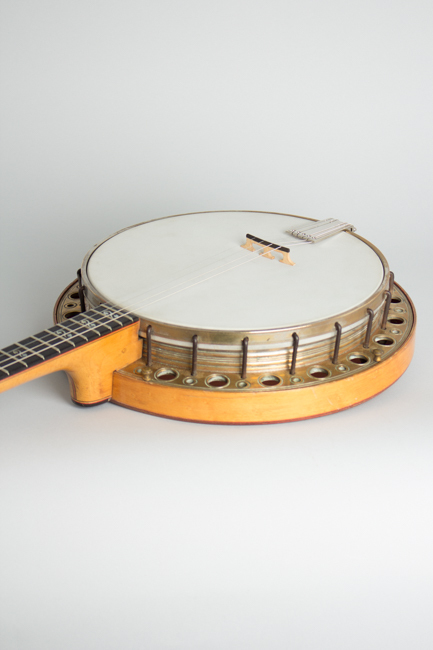 It is likely that the wooden neck and resonator were sourced from William Lange's banjo factory on East 24th Street, which acted as a subcontractor for many smaller builders. The pearl work is very similar to the Paramount 1920's style. Michael Iucci and his father operated a small music shop at the Broome Street location. They sold, built and repaired musical instruments and the younger Iucci was an accomplished banjoist himself. 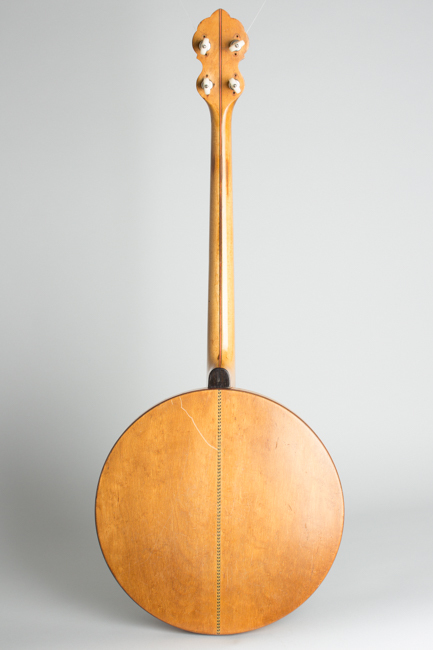 Iucci created a surprisingly large number of instruments considering the limited resources available, and offered an extensive variety of style options. 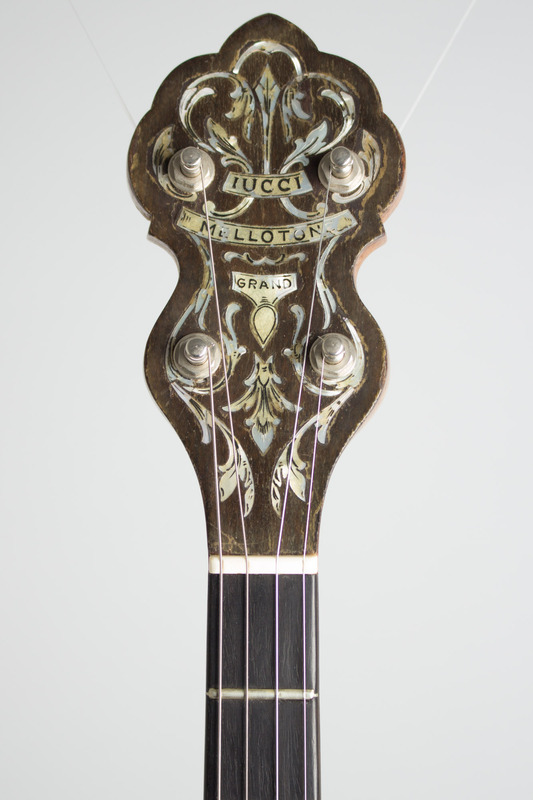 As far as is known all Iucci branded instruments were sold locally directly from the family shop, and they never engaged national distribution. This is far from the fanciest but nevertheless fine professional grade tenor banjo from this talented and sadly obscure builder. Overall length is 33 1/4 in. (84.5 cm. ), 10 3/4 in. (27.3 cm.) diameter head, and 3 in. (7.6 cm.) in depth, measured at side of rim. Scale length is 22 1/2 in. (572 mm.). Width of nut is 1 1/4 in. (32 mm.). This banjo is in fine playing condition with no major repairs but some parts modifications, and average light wear overall. The frets are unusually large wire for the period but appear to be original. The tuners have been changed -probably some time ago- the instrument currently carries a set of geared Planet pegs from the 1970's or '80's. The tailpiece has been changed to a Kersher style 5-string piece and an unmounted original Iucci lever mute is also stowed in the case. The hard shell case itself is a good quality piece from the 1960's or early 1970's that is not an exact fit. 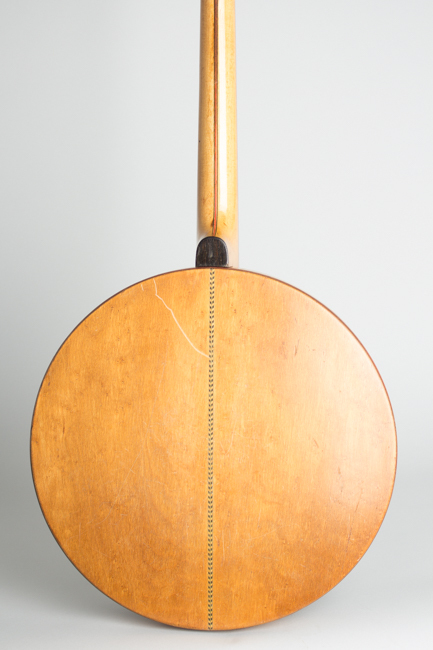 This banjo is a fine player's instrument with a powerful sound; it is also of interesting historically as Iucci instruments are fairly rare and all hand made, so many are unique. Excellent - Condition.